Freestyle Music Park expansion for 2010? FSMPBlog.com posted some photos today of markers that have some up at Freestyle Music Park. The markers are located behind the Tiki Mart in Myrtle’s Beach. Most people think the park needs another water ride, which would fit very nicely in the beach themed area of the park. Bing Maps birdseye of the area during the park's constuction. The area on this years park map. What do you think would fit nicely in this area? Leave your comments and park thoughts! Disney Hollywood Studios (at the time Disney-MGM Studios) became the thrill destination of Walt Disney World when it opened Rock n’ Roller Coaster in 1999 and Tower of Terror just three years prior. Themed to a sound studio for Aerosmith, riders are big fans of the band and are given back stage passes to see the concert. But the concert starts in a quick moment so guest hop on to their own stretch limo and speed down the streets of Los Angeles to the concert. Themeatically, the ride is nice but the building is kind of wierd. It is much more movie studio then sound studio. Not to mention the outdoor queue is pretty much awful as it just winds around a few switch backs, nothing to special. Once in the main building you go through different rooms of the studio that feature gutiars from the band, some sounds systems before heading into the main preshow. Here guest are told that since they are such huge fans of the band they get back stage passes. But their manager comes in and informs everyone that the concert starts in a few minutes. Quickly everyone runs to their stretch limo. Finally in the main launch room, your limo pulls up and you strap in ready to ride. 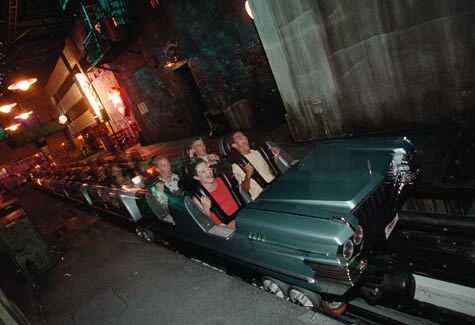 Make a quick 90 degree turn before waiting at the launch for “3….2…..1” Your limo is fired out of the launch pad and onto the track where guest’s on ride photo is taken. From here the ride bends and twist around a series of inversions, twists, and hills. All while passing the “sights” of L.A. Unfortunately, these sights kill the ride. They are just cheap card board cut outs that are painted to resemble everything from the famous Randy’s Donut’s Giant Donut, to the Hollywood sign. Each one is just as 2-D looking as the next. The park really should have gone with enclosed full out sets, or what Walt Disney Studios Paris did with lights fog and so much more. Just imagine that you were litteraly launched into the concert with loud music, spotlights, and of course Aero Smith. Rock n’ Roller Coaster concludes with a break run at the walls of the concert. Guest exit their limo in a seperate unloading zone from the loading dock. The unloading area is themed to a red carpet arrival where guest are the stars walking into the….you guessed it, gift shop! Riders can view their on ride photos and purchase some memrobillia from their thrilling ride. What makes this ride so fun though is the sound system. Each train features a different on board audio track. For one it is “Dude look like a lady” while in another it might be “Love in an Elevator”. Not only does it make riders not to know what their expierence will be like, but it also makes each ride a little different so re-rides are great. While the layout isn’t very intense, the ride does have a good build up. As far as stories go, Rock n’ Roller Coaster’s is good, just poorly executed. Even though the build up is nice, the main ride building isn’t dark enough and the layout is really tame. I would take California Screamin’ over this ride anyday. Do you like Rock n’ Roller Coaster? Agree with me? Disagree with me? Leave your comments and park thougths! Today Worlds of Fun released some teasers of plans for what could be a new Halloween Haunt maze. The plans don’t really show much, but them teasing like this obviously means that they will be getting at least 1 new maze for the Halloween event. Nik Wallenda walks the Sky Ride above Cedar Point! As part of “Cedar Fair’s Nick Wallenda’s Walk Across America Tour” Nik made a stop at Cedar Point to walk the tight rope high above the park. Each and every time he does this he astound guests with his amazing tricks. Lightning Really Does Strike Twice? Another mysterious “box” has popped up at Carowinds similar to last years Carolina Cobra crate. This year’s is a huge metal container and contains several clues to what Carowinds will be recving in 2010.